Did a Secret Military Experiment Cause the 2003 Blackout? We bring to our readers a highly controversial article. While the main thesis presented is not proven, the facts and analysis presented deserve to be taken seriously. The author of this article is a scientist who works in ionospheric research and who is well informed on the impacts of the HAARP program. In our opinion, the matter requires further investigation before arriving at a definitive statement on the causes of the blackout. We, nonetheless, believe that the analysis and facts presented in this article warrant the attention of the various governmental agencies in the US and Canada involved in the investigation of the August 14 blackout, including the NY Public Service Commission, the Northeast Power Coordinating Council, the joint US-Canada task force and the congressional inquiry. On August 14, 2003, just a few minutes after the stock market closed for the day, a nine-minute 'event' had brought the entire Northeastern power grid down. It is believed that over fifty million people lost power that afternoon. Since this unprecedented event, blame games have flown back and forth, but no real answers have been provided. It is believed that the event originated in an area in the power grid where there is a bottleneck of power transmission between the eastern U.S. and the Midwest. But what has caused this mess? Outdated equipment, irresponsible power companies, and politicians have all been blamed without any solid evidence to support the accusations. What hasn't been suggested is the possibility that this was a secret government test that served the purpose of fulfilling requirements for sophisticated warfare and security response mechanisms. Here are the facts. The power grid that was affected was the northeast grid. Not the vulnerable California grid, or the southeastern grid that Washington DC relies upon, and not that strangely isolated Texas oil grid. It was the grid that the northeast U.S. and southeast Canada rely on. A region that a large scale outage would not have a really devastating effect on the economy or military control centers. The event conveniently began a few minutes after the closing bell on Wall Street as to not effect the days trading, but while power usage in the northeast on that hot day was still at peak. The event began in a bottleneck region where only a few percent increase in power flow could cause such a critical failure of the entire grid. The physical cause of the event such as the classic squirrel shorting out a transformer, has not been found; there were no indications of any lightning being present; nor was there any significant solar activity to cause an unexpected surge in the grid. Finally, the HAARP (High Frequency Active Auroral Research Project) was turned on just after 4:00 PM EST on that fateful day. The question is 'Could a secret HAARP experiment have caused the blackout?' Interesting ionospheric effects occurred on 8/14/2003 that would have made the conditions for such a secret military test ideal, including a widespread, highly reflective ionospheric layer being expected (and was likely created by the electron event seen in figure 1), which would allow ideal conditions for signal propagation over long distances. 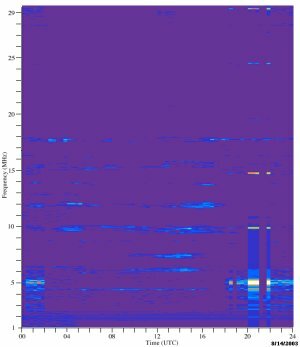 Unfortunately, the ionosonde data that would help show where the effects of HAARP were directed by providing a picture of the ionosphere were not posted on the day of the blackout. The Gakona Ionosonde data is frequently not posted when classified HAARP experiments take place. What we do know is that HAARP was turned on at or just after 4:00 pm EST; it would take a few minutes for the target area to respond (say around 4:05 pm) which would allow a nine minute event to knock the power out at 4:14 pm EST. Those of us who work in ionospheric research, and who are concerned with environment risks associated with ionospheric warfare are familiar with HAARP. The basic concept that HAARP relies upon is based on work by N. Tesla when he was attempting to devise a method for the wireless transmission of electrical power, and subsequently picked up in the early 20th century for the purpose of finding a way to modify the weather. It is thought that this technology was used by world leaders such as Stalin, whom during important outdoor events may have used such technology to prevent unwanted rain or fog. These claims were often associated with widespread reports of people feeling mysteriously ill. One of the leading researchers in this field is Dr. Bernard Eastlund, whom to this day accepts money from organizations such the European Space Agency to research potential weather modification applications including the possibility of stopping tornadoes with this type of technology. HAARP is a phased-array ionospheric heater that is capable of focusing large quantities of electromagnetic energy into very localized regions that are very far away from the source. It is entirely possible that the HAARP heaters were directed at the power grid's bottleneck while the grid was operating near peak capacity. 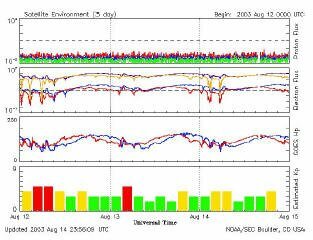 The sudden presence of electromagnetic energy could easily force an unexpected increase in the power flow which could in-turn cause a critical failure such as the one seen on august 14, 2003. Despite the claims of HAARP advocates, ionospheric heaters can use the ionosphere to reflect their energy at distances several thousand miles away by using the ionosphere as a 'mirror' much the same way as AM radio signals travel over vast distances. Unlike an AM radio, HAARP can use phase interference to focus it's energy on a localized area (such as the weak point on the power grid). The only requirement to achieve geographic precision is that geomagnetic activity be minimal such as it was on the day of the blackout. Also, there was a short duration test about' 20 minutes before the hour. Such a test would serve the purpose of showing the researchers exactly where the beam would focus itself given the cur- rent conditions, and would be a necessary step before executing such an experiment. So why would the government do this to us? Well, first of. all, HAARP is sponsored primarily by the Air Force Weather Agency and 'other agencies', and is known to be used as an ionospheric warfare tool. This would be an ideal way to test possible military applications of the instrument. It would be of great military value if :we could cause an entire region to lose electricity almost instantly without dropping a single bomb. Of course, this would need to be tested in a controlled environment where the effects could be thoroughly analyzed (such as on our own soil). It would be done in an area that could most easily handle such a large-scale power outage (such as the northeast US). Also, being in a new age of terrorism, this was an excellent homeland security response test. By having a blackout that covered one quarter of the country we can now see how people would respond, what the strengths and weaknesses of our emergency response systems are, and how quickly we could restore our systems to operating capacity. If this was a military experiment it would certainly have served multiple purposes. I also believe it would have been a strong temptation for anyone with the power to conduct such an experiment to do so. The blame games that have gone on since the blackout have no hard evidence to back them up. Although it may sound like an episode of the X-files, the facts are clear; HAARP is an ionospheric warfare tool, it is capable of focusing it's electromagnetic energy at long distances, it was turned on right at the time the event began, and such a scenario would serve multiple national security interests simultaneously with minimal economic impact. So we must ask ourselves, is considering HAARP as a potential source of the blackout a ridiculous conspiracy theory, or is it the most reasonable explanation given the facts? I am a concerned ionospheric physicist whom has worked with HAARP. I am concerned with the unknown environmental and military implications of this device, and the potential abuses thereof. I am not a conspiracy nut, and I do believe that HAARP is a useful tool that needs to be put into responsible hands where it is not abused and where the public has full access to it's experimental capabilities and data. It is an instrument that is paid for by tax-payers dollars and is currently not in the hands of people who have earned or deserve our confidence and trust. So what really happened on August 14? I'm really not sure, but we must ask ourselves what the most likely scenario's are without ruling out any possibilities; even those that sound like they have no place other than the sci-fi channel. "The Truth is out There", so I leave it for you to decide. Regretfully, because I am a research scientist, and because I face the possibility of certain repercussions in my field of work for revealing this information to the public, I cannot reveal my true identity. I believe the facts I have presented herein are sufficient to speak for themselves and should convince the public that oversight is needed when experimenting with aspects of the atmosphere that are not well known. The data that is presented was accessed from the National Oceanographic and Atmospheric Administration website at www.sec.noaa.gov, and from the HAARP homepage at www.haarp.alaska.edu . � Copyright 2003 For fair use only/ pour usage �quitable seulement .